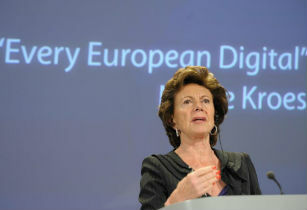 Neelie Kroes, the European Commissioner for the Digital Agenda, has claimed that when they were taken to a government conference in Azerbaijan their laptops were hacked . The attacks allegedly took place at the hotel that Kroes and EC staff were staying at and they were alerted by security warnings from Apple. The allegations were made in a blog post written by Kroes on Azerbaijan but they opposed the allegations by claiming that they were made to undermine the image of the country. “I wondered for a very long time whether I should attend this week’s Internet Governance Forum in Baku. But in fact many of the dozens of journalists, bloggers, and human rights defenders I met here thought it was helpful,” said Kroes.